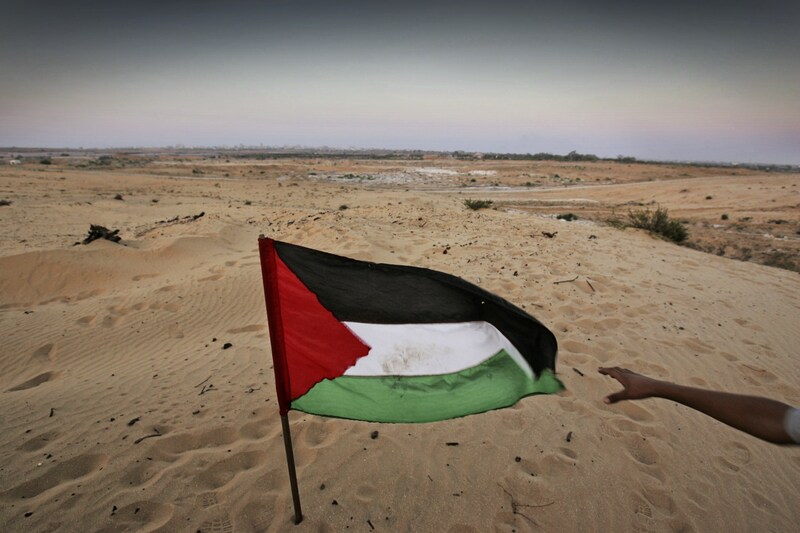 The Gaza Strip, with its barely three hundred and sixty square kilometres of land and one million and a half inhabitants, is one of the most controversial and long-suffering venues of the Arab-Israeli conflict. 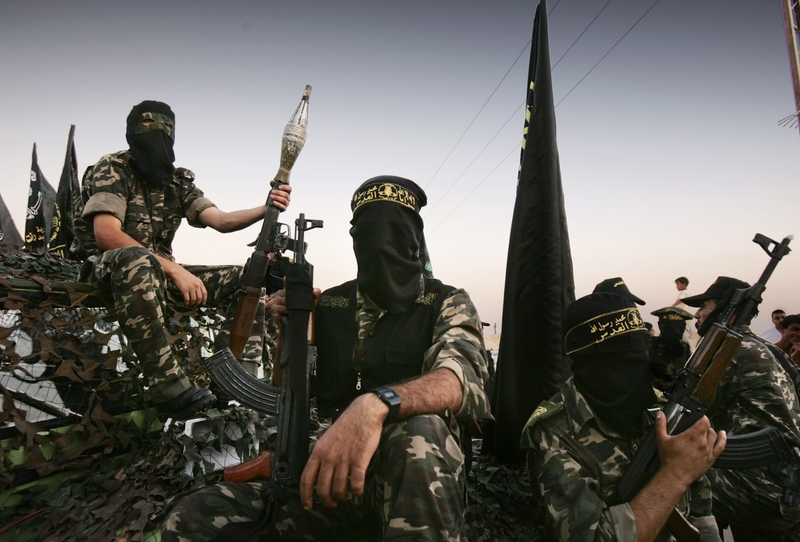 The minuscule region, bordering with Israel and Egypt along the Mediterranean coast and part of the Palestinian Territories, is currently governed by the Islamic fundamentalist organisation Hamas. Following the end of the British mandate and the foundation of the State of Israel in 1948, the Strip is occupied by Egypt until 1967, when, as a result of the so-called Six Day War, it falls under the control of Israel up through 1994. During these 27 years of occupation, 21 Jewish settlements come into being, depriving the Palestinians of additional land, while the Israelis expropriate all the civic plants and systems and services. With the signing of the Oslo Accords in 1993, the Strip becomes part of the territories governed by the PLO, the Palestine Liberation Organisation, led by Arafat, though control of the checkpoints and the zones holding settlements remains with the Israelis. 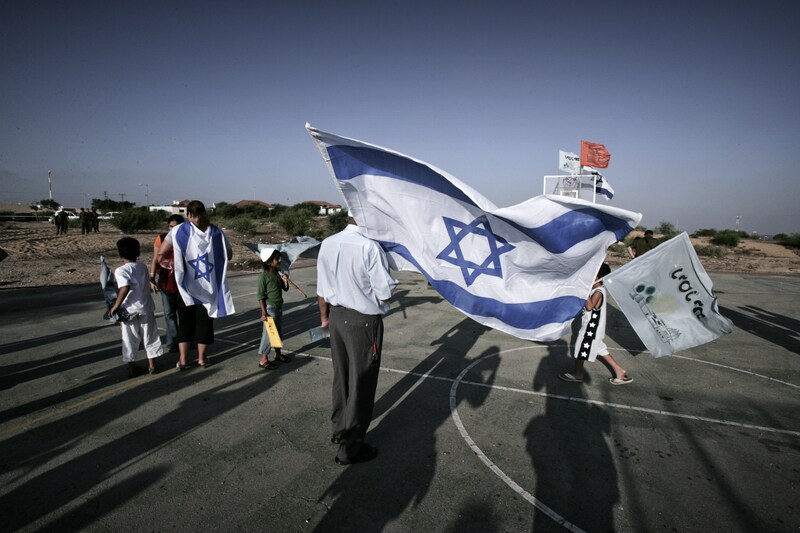 On 14 August 2005, based on a unilateral Israeli plan for disengagement signed by Prime Minister Ariel Sharon, the colonists are urged to evacuate the settlements, considered by the UN to be unlawful and contrary to the cause of peace. But not everyone heeds the request, and the removal of the settlers is marred by violence. On 12 September 2005, the Israeli Army formally cedes the Gaza Strip to the Palestinian Authority, though, for all intents and purposes, it continues to exercise control over the borders, the airspace and the territorial waters. 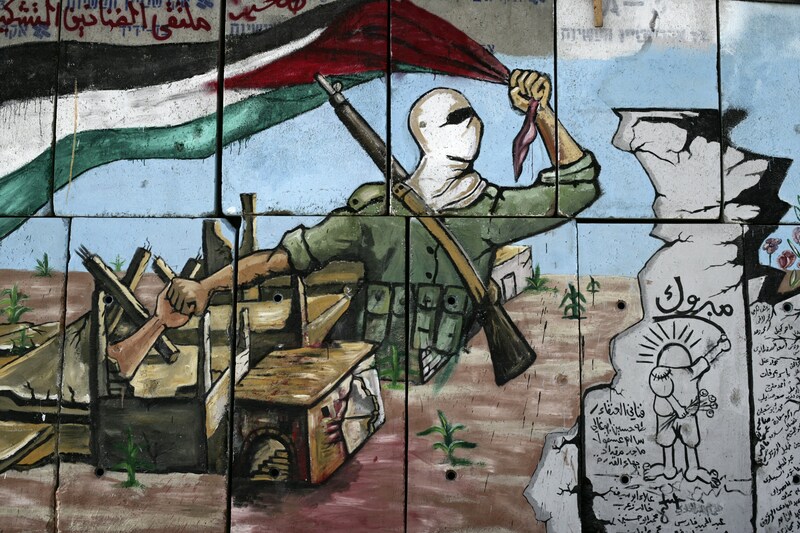 When the Hamas party, considered to be a terrorist organisation by the Western nations, wins the 2007 elections, a violent aftermath proves unavoidable. Following internal clashes with militants of Al-Fatah, a new, tragic escalation of the conflict further dramatises the already extreme conditions of life in Gaza: the Launching of Qassam missiles by Hamas is met by Israel with Operation Cast Lead (2008/2009), which leaves more than 1400 Palestinians dead, over half of them civilians. The Israeli dead number nine, of which three were civilians. Violations of human rights are reported by both sides. The Strip is placed under a harsh embargo, which exasperates the already difficult humanitarian situation, creating what amounts to a prison for the million and a half people who live there: hundreds of seriously ill patients are kept from leaving to receive treatment; many students cannot reach their universities abroad; 78% of the population lives below the poverty line, on an income that, in the majority of cases, is no more than two dollars a day; the rate of unemployment runs as high as 38%, and more than 30% of all adults suffer disturbances caused by post-traumatic stress. 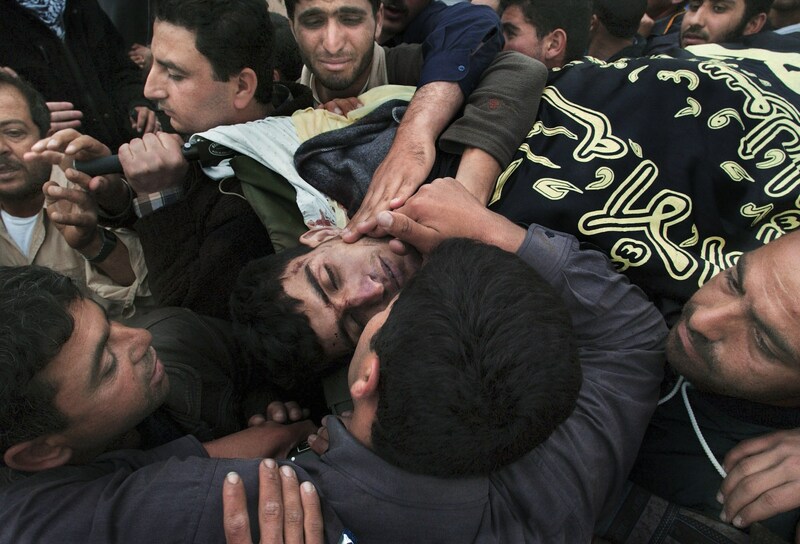 A relative of Wadah El Batesh, 25, kisses his body during his funeral. Wadah was shot and killed by Israeli troops while attempting to attack the Kissufim border crossing with Israel. A young boy tries to catch a Palestinian flag in front of his settlement while waiting for the Israeli Army to withdraw so he can re-enter. Palestinian police and soldiers were deployed outside the Gaza Settlement while the Israeli Army is expected to withdraw. 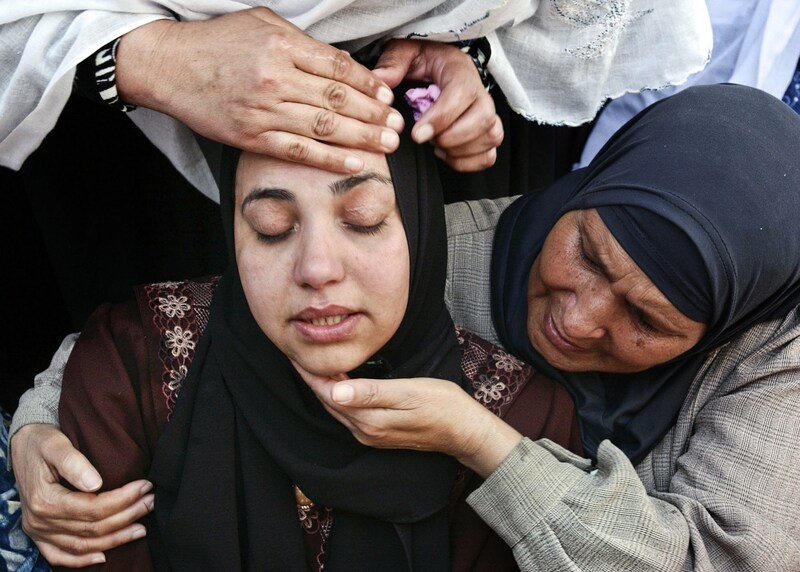 Relatives of Najy El Ajrami, 21, are overcome with emotion during his funeral. Najy El Ajrami was shot and killed by Israeli troops after attacking a military outpost with grenades near the Jewish settlement of Dugit in the northern Gaza Strip. 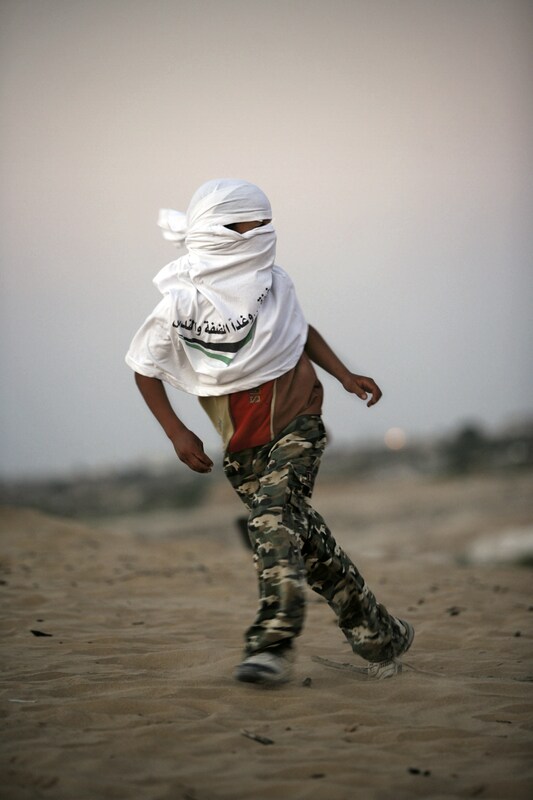 A Palestinian boy run towards the settlement while waiting for the Israeli Army to withdraw so he can re-enter. Palestinian police and soldiers were deployed outside the Gaza Settlement while the Israeli Army is expected to withdraw. Israeli settler Smadar Ben Hayim (R) embraces her friend and neighbor Karnit Levy before evacuating her family home. The disengagement will remove approximately 9,000 Jewish settlers from 21 settlements in Gaza and four in the West Bank, some of whom have resisted. 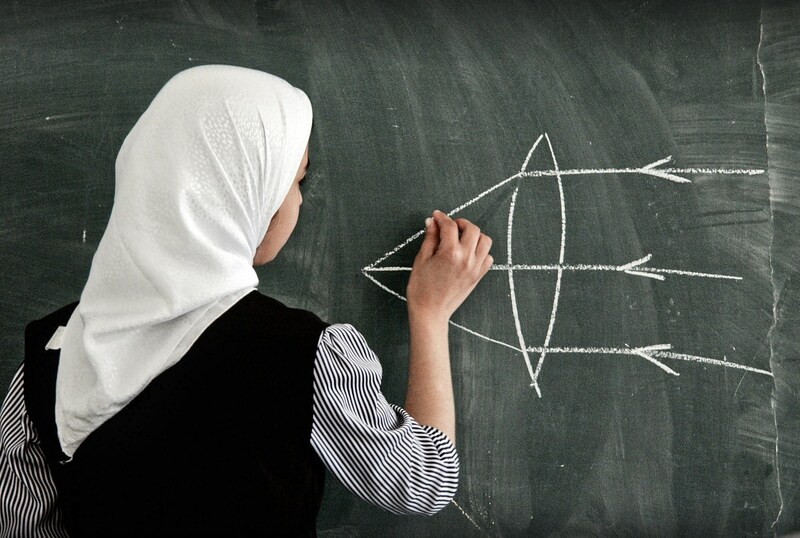 A Palestinian schoolgirl draws on the chalk board during her class in a school supported by the UNRWA (United Nations Relief and Works Agency for Palestine Refugees in the Near East. UNRWA provides 9 years of schooling for a population of 177,474 students in 168 schools with a 4.75% increase of students compared to the previous year. This increase is due to the population growth and the Palestinians who have returned home to Gaza. More than 13,000 pupils of returning families have been admitted to UNRWA schools in Gaza since 1994. Jewish Settler, Dina Zaffer, stands in her house before evacuating the settlement. 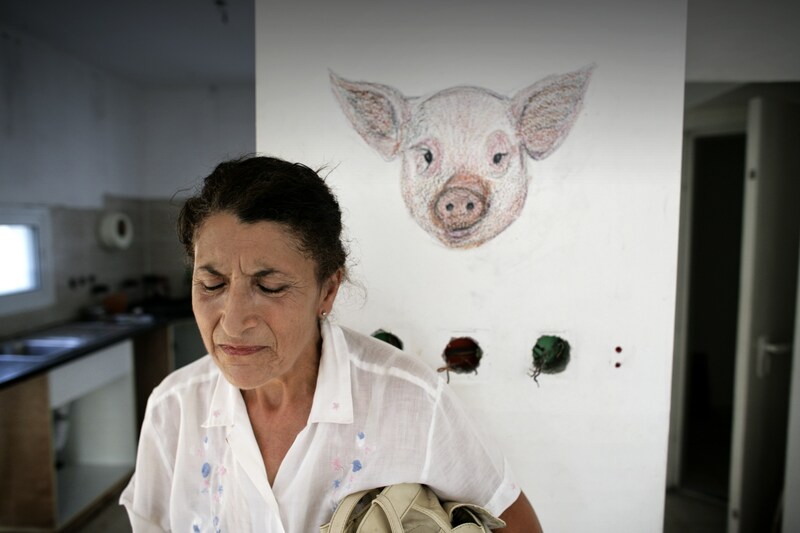 She has painted some pigs on the wall to prevent the Palestinians from entering. Gaza settlers received formal letters from the military telling them that as of August 15, 2005 their presence in Gaza will be illegal and they will be removed by force from August 17, 2005. The pullout will remove approximately 9,000 Jewish settlers from 21 settlements in Gaza and a further four in the West Bank with settler resistance expected. 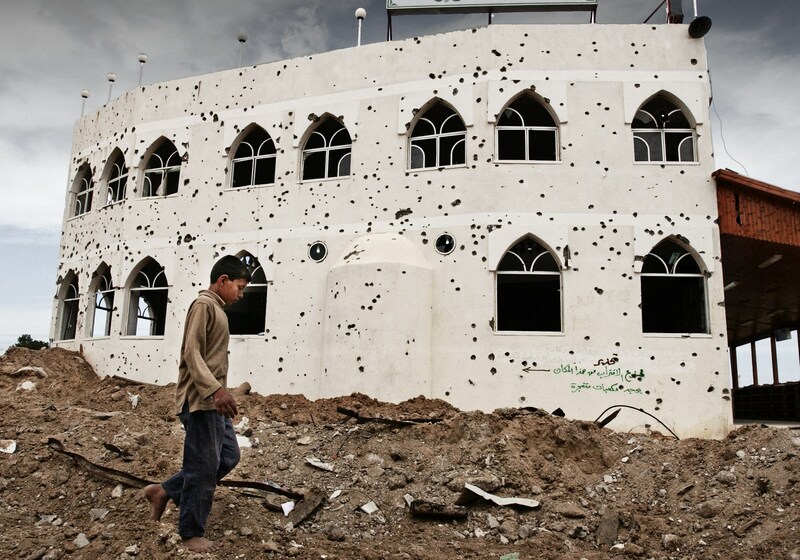 A Palestinian child walks in front of a mosque that has been shelled by Israeli machine gun fire during the incursions which occurred over the last three. Israeli soldiers of the Blue Battalion attend the final speech from their commander Col. Chaim Moria before the disengagement operation begins. Reim Army Base was built two months prior and hosts roughly 15,000 Israeli Forces from the Army, Navy, Air Force, Police and Border Police that conduct the evacuation of Jewish Settlers from Gaza. 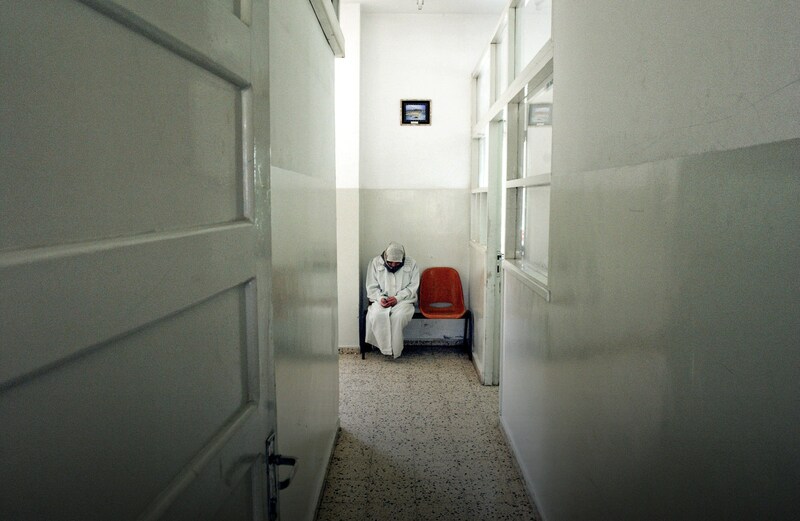 Ilham Salim Al Masa, 35, suffering from a psychiatric disorder, awaits for her brother to take her home after three weeks at the Gaza City Psychiatric Hospital. The twelve resident psychiatrists of the only psychiatric hospital in the Gaza Strip have seen a twenty-three percent rise in Palestinians seeking psychiatric treatment since the beginning of the second Intifada, nineteen months ago. 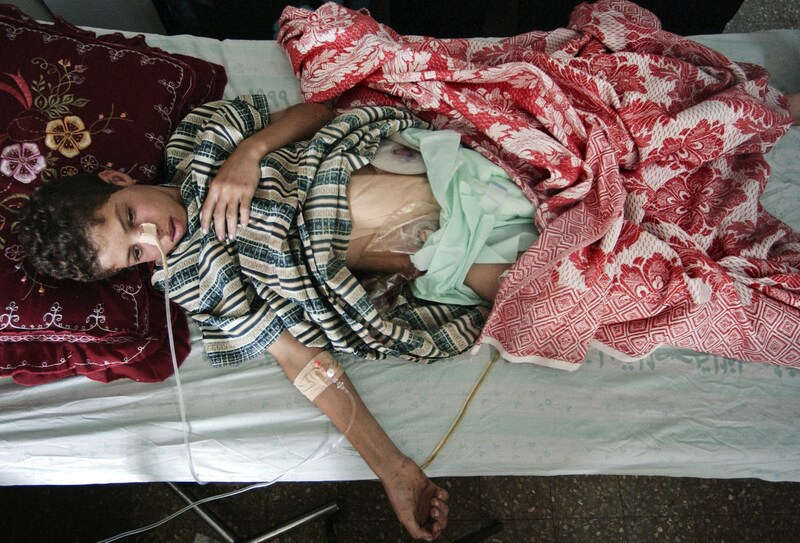 Ahmed Hilo, 14, lies in his hospital bed as he recovers at Shifa Hospital. Ahmed was shot in the chest while playing with friends near the Karni crossing between Gaza and Israel. Nearly twenty months of Israeli-Palestinian fighting has taken a heavy toll on the children and teen-agers of Gaza with many reacting to events they witnesses or see on television with anything from suicidal tendencies and aggressive behavior to depression and post traumatic stress disorder, according to social workers and psychologists. 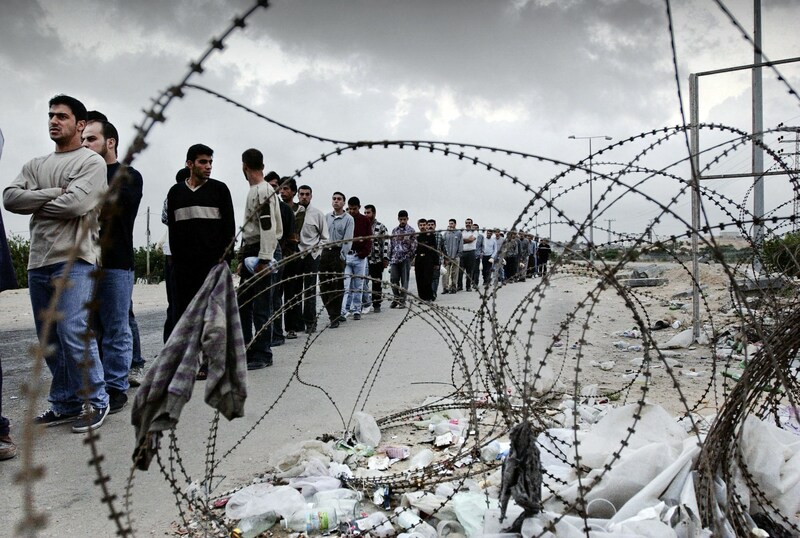 Palestinian workers wait in line to pass through Israeli security in order to get to their jobs in Israel at the Erez Industrial Park which sits on the border with the Gaza Strip. Erez Industrial Park is home to more than 172 factories, owned by both Israelis and Palestinians manufacturing everything from furniture to toys, which employ 4,400 workers of whom ninety percent are Palestinian. 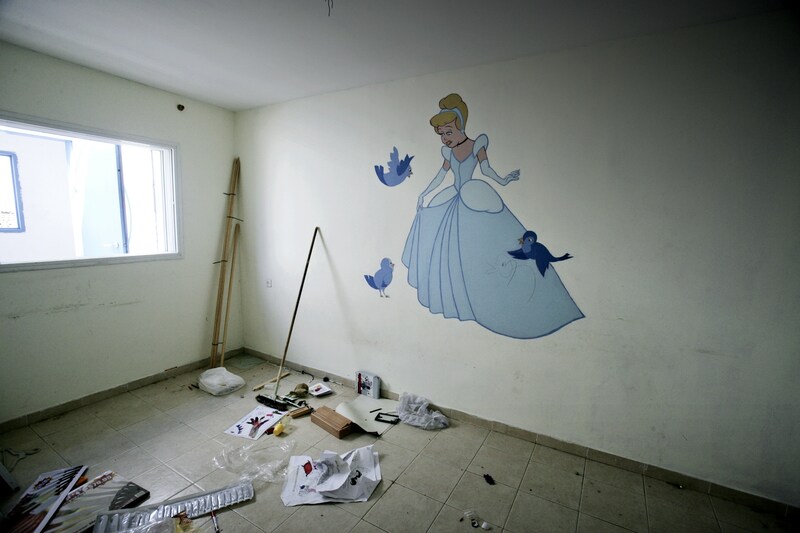 A painting of Cindarella is seen in an empty house abandoned by Jewish Settlers during the second day of the disengagement from the Gaza settlement. Gaza settlers received formal letters from the military telling them that as of August 15, 2005 their presence in Gaza will be illegal and they will be removed by force from August 17, 2005. The pullout will remove approximately 9,000 Jewish settlers from 21 settlements in Gaza and a further four in the West Bank with settler resistance expected. 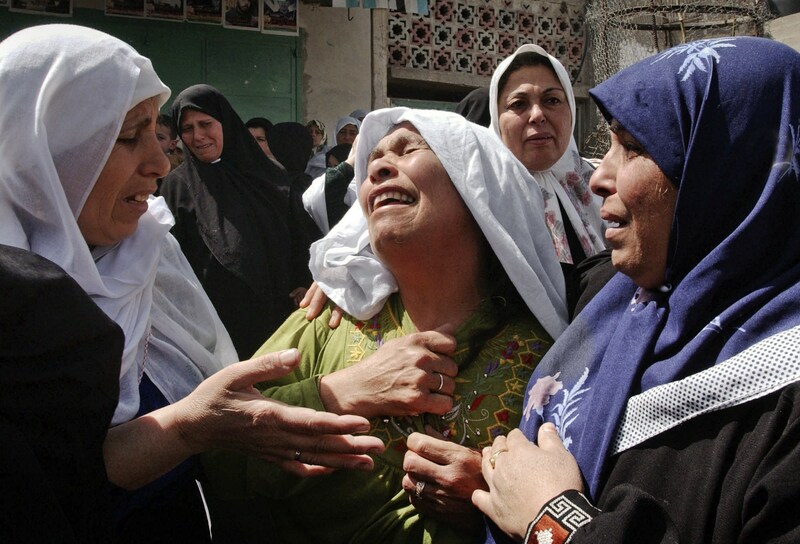 Relatives of Palestinian police officer Khalid Jarour, 23, are overcome with emotion during his funeral. Khalid was shot and killed in the West bank town of Bethlehem during the recent clashes between Israeli troops and Palestinian militiaman. Palestinian members of the Islamic Jihad Militant Movement join hundreds of other militants at a rally in the Netzarim Settlement to celebrate the Israeli pull-out from the Gaza Strip. 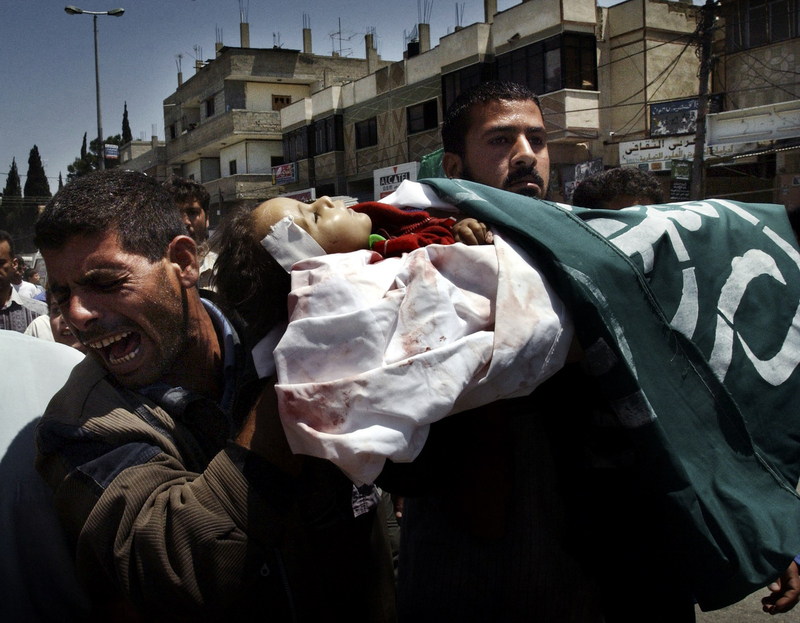 Mohammed, 32, left, the father of Hoda Shalof, 11 months old, is overcome with emotion while he carries her body during her funeral procession. Hoda and three other people were killed when Israeli soldiers shelled their houses in response to an explosion near the border with Egypt in the southern Gaza strip. A graffiti mural on the former Israeli Security wall that divided the Gush Katif settlements from the nearby refugee camp. Several families are living on the edge of the former Israeli Security fence that secured the Gush Katif settlements from the nearby refugee camp. 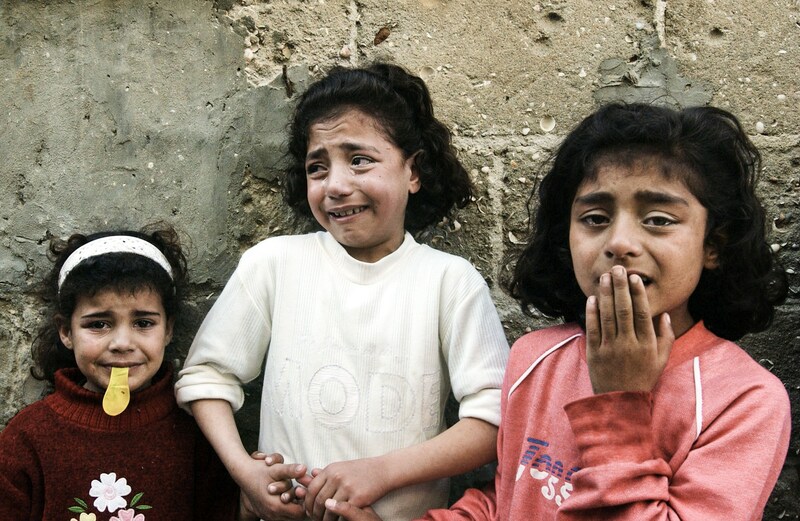 Their houses were often targeted and shot at by the Israeli Army from the nearby check-point. In the last four years hundreds of houses have been damaged and destroyed due to the fighting between the Israeli Army and the Palestinian militants. During the past four years many of those families have been separated from their relatives living in the Mawasi Area on the other side of the Israeli security fence. 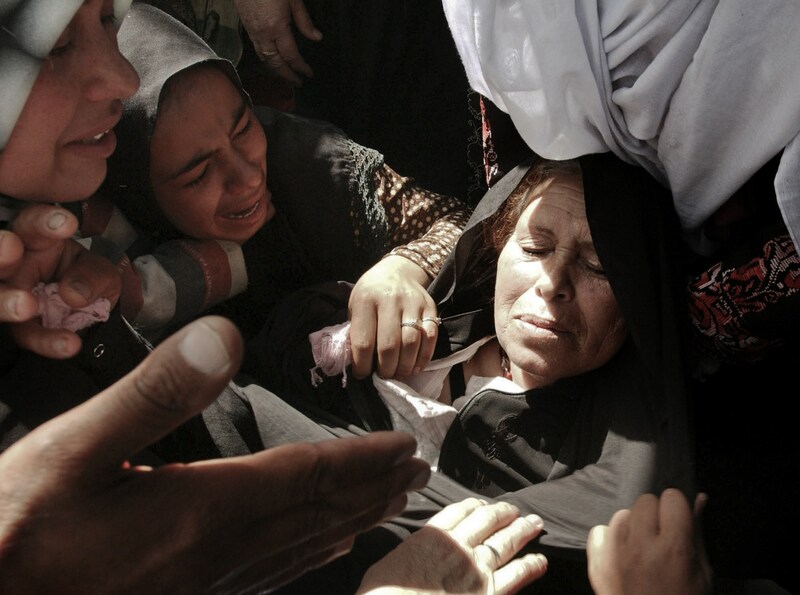 Relatives of Najy El Ajrami, 21, are overcome with emotion during his funeral in his house in the Jabalia refugee camp. Najy El Ajrami was shot and killed by Israeli troops after attacking a military outpost with grenades near the Jewish settlement of Dugit in the northern Gaza Strip. A Palestinian gunman is overcome with emotion while he waits to carry the body of his friend, Mohamed Abu Garaba, 34, outside the morgue of the Al Aqsa Martyrs Hospital. Mohamed was killed in front of his house during an incursion by Israeli troops outside the Kfar Darom Jewish settlement in the central Gaza Strip. An Angry Jewish settler child cries on a bus in protest against his forced removal by Israeli troops from his. The 12 resident families and hundreds of their supporters were forcibly evicted under Prime Minister Ariel Sharon’s disengagement plan. Amal, 20-years old the daughter of Aysha Abu Alwan,42-years-old stands next to a wall in her house marred with bullets. Amal was shot in her right hand by the Israeli Army who has also demolished the lower level of her house, according to the family. The Abu Alwan family is one of many families living on the edge of the former Israeli Security fence that secured the Gush Katif settlements from the nearby refugee camp. Their houses were often targeted and shot shot at by the Israeli Army from the a nearby check-point. In the last four years hundreds of houses have been damaged and destroyed due to the fighting between the Israeli Army and the Palestinian militants and many families have been separated from their relatives living in the Mawasi Area on the other side of the Israeli security fence. Jewish Settlers attend a farewell ceremony in the Nisanit Settlement during the second day of the government mandated disengagement. Gaza settlers received formal letters from the military telling them that as of August 15, 2005 their presence in Gaza will be illegal and they will be removed by force from August 17, 2005. The pullout will remove approximately 9,000 Jewish settlers from 21 settlements in Gaza and a further four in the West Bank with settler resistance expected. High Ranking Palestinian police officers hold a conference over a map of the settlements as they get ready to deploy outside the Kfar Darom Settlement for the expected withdrawal of the Israeli Army. 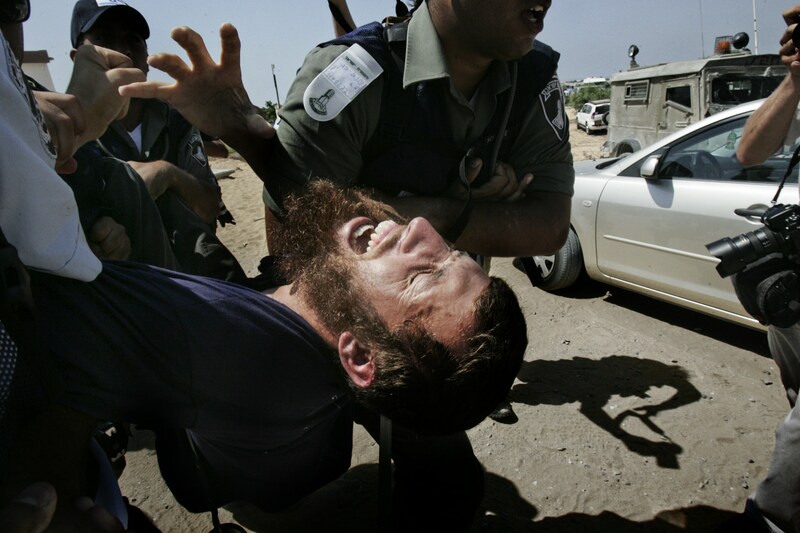 A Jewish settler is removed by force by Israeli troops from his home and escorted to a bus in the Kerem Atzmona illegal settlement outpost in the Gaza Strip. The 12 resident families and hundreds of their supporters were forcibly evicted under Prime Minister Ariel Sharon’s disengagement plan. 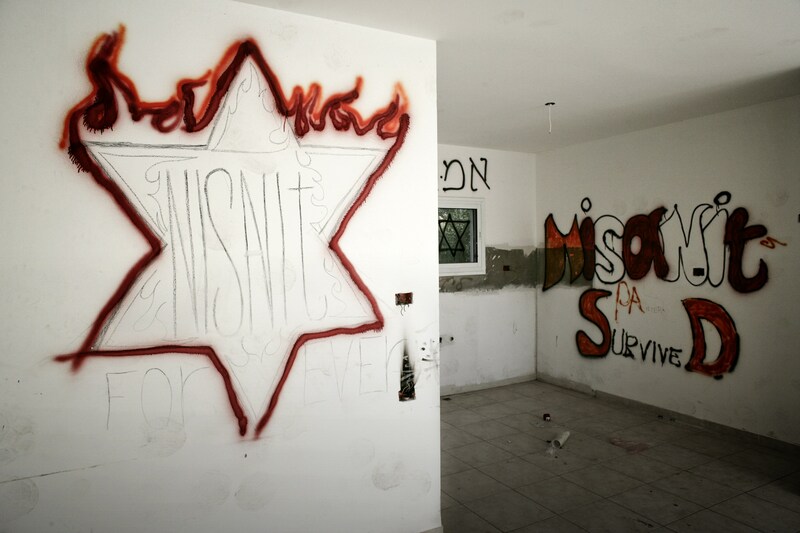 A star of David with the words, “Nisanit Survives” is painted on a wall of an abandoned Jewish Settler’s house. Gaza settlers received formal letters from the military telling them that as of August 15, 2005 their presence in Gaza will be illegal and they will be removed by force from August 17, 2005. The pullout will remove approximately 9,000 Jewish settlers from 21 settlements in Gaza and a further four in the West Bank with settler resistance expected. Nahlh Hasonh, 27, (left) is overcome with emotion during the funeral of her brother, Palestinian security forces officer Ibrahim Hasonh, 22 who was shot and killed by Israeli troops in Tel Aviv after he has shot and killed three Israeli soldiers in a restaurant. 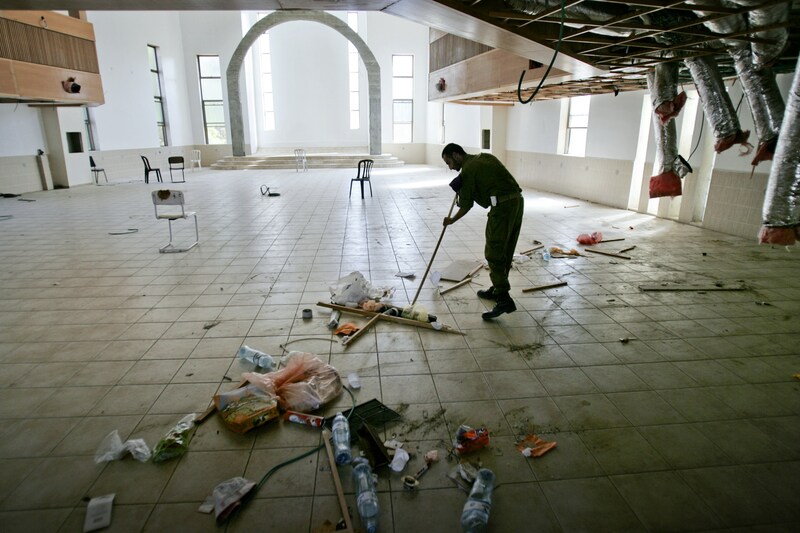 An Israeli soldier cleans the floor of a synagogue after the Israeli pullout from Gaza that has removed about 9,000 Jewish settlers from 21 settlements in Gaza and four in the northern West Bank. The Israeli Army is demolishing all the settlements and is expected to leave the Gaza Strip within two weeks time. Jewish Settlers cry as the Israeli Army evacuate the Synagogue in the Nisanit Settlement during the first day of the government mandated disengagement. Gaza settlers received formal letters from the military telling them that as of August 15, 2005 their presence in Gaza will be illegal and they will be removed by force from August 17, 2005. The pullout will remove approximately 9,000 Jewish settlers from 21 settlements in Gaza and a further four in the West Bank with settler resistance expected. 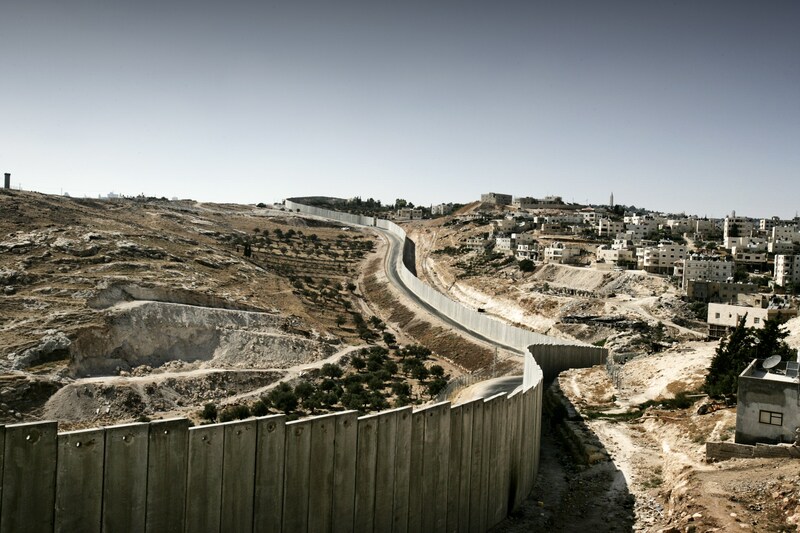 Israel’s highly controversial West Bank barrier in which the graffiti artist Banksy has painted some of his murals. Banksy has made a name for himself with provocative images stenciled around the streets of London. On his recent trip to the Palestinian territories he has created nine murals on Israel’s highly controversial West Bank barrier. 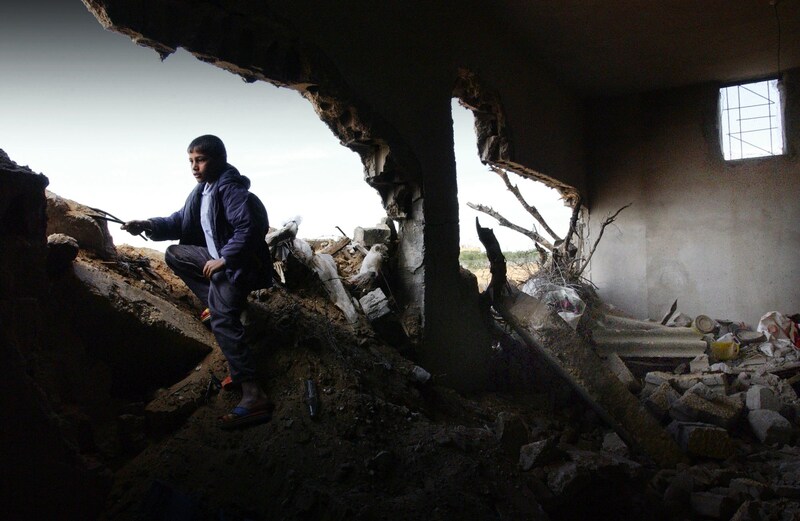 A Palestinian child looks onto the border, controlled by an Israeli observation tower, between the Gaza Strip and Egypt from a house that has been destroyed by Israeli tanks and bulldozers during the most recent military incursions. Jewish Settlers attend a farewell ceremony in the Nisanit Settlement during the second day of a government mandated disengagement plan. Gaza settlers received formal letters from the military telling them that as of August 15, 2005 their presence in Gaza will be illegal and they will be removed by force from August 17, 2005. The pullout will remove approximately 9,000 Jewish settlers from 21 settlements in Gaza and a further four in the West Bank with settler resistance expected. Jewish Settlers cry as the Israeli Army evacuates the Synagogue in the Nisanit Settlement during the first day of a government managed disengagement plan. Gaza settlers received formal letters from the military telling them that as of August 15, 2005 their presence in Gaza will be illegal and they will be removed by force from August 17, 2005. The pullout will remove approximately 9,000 Jewish settlers from 21 settlements in Gaza and a further four in the West Bank with settler resistance expected. 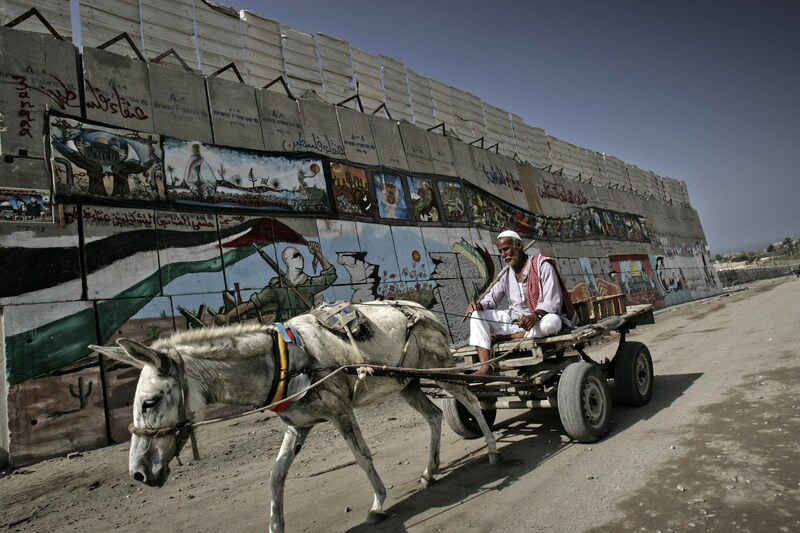 A Palestinian farmer passes by a graffiti mural on the former Israeli security wall that divided the Gush Katif settlements from the nearby refugee camp. Several families are living on the edge of the former Israeli Security fence that secured the Gush Katif settlements from the nearby refugee camp. Their houses were often targeted and shot shot at by the Israeli Army from the a nearby check-point. In the last four years hundreds of houses have been damaged and destroyed due to the fighting between the Israeli Army and the Palestinian militants and many families have been separated from their relatives living in the Mawasi Area on the other side of the Israeli security fence. 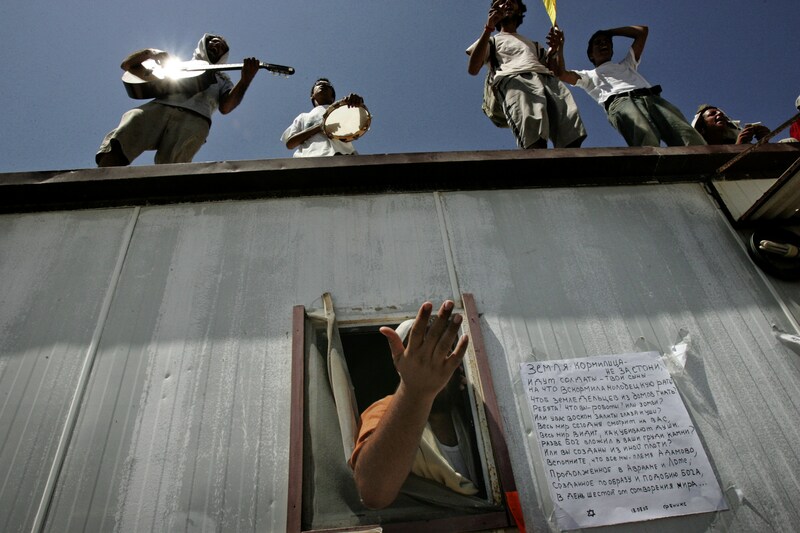 Angry Jewish settlers stand on the roof in protest against their forced removal by Israeli troops from their home in the Shiryat Hayam illegal settlement outpost in the Gaza Strip. The resident families and hundreds of their supporters were forcibly evicted under Prime Minister Ariel Sharon’s disengagement plan. 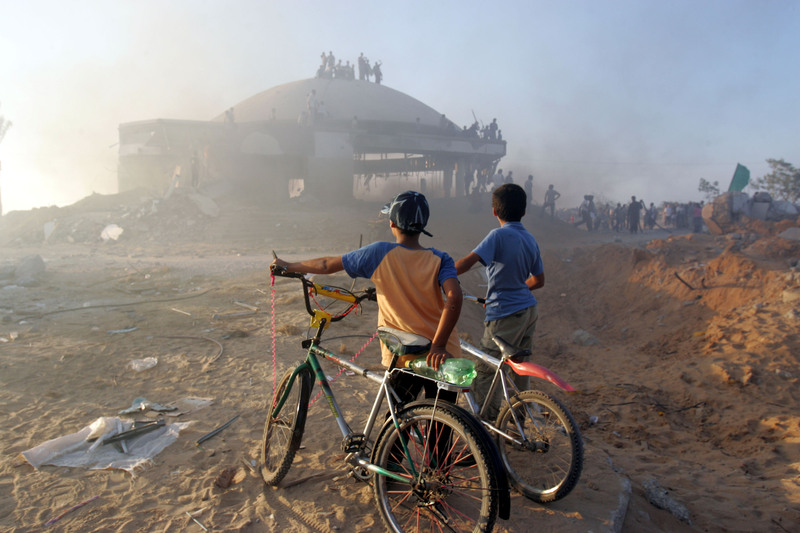 Two Palestinian boys look on at fellow Palestinians demolishing a Synagogue as they celebrate the Israeli withdrawal in Netzarim Settlement. Thousands of Palestinians and militants of the three main Palestinian movement Hamas, Islamic Jihad and Fatah entered singing and chanting into the settlement and set fire, demolishing the synagogue and what was left of the settlement after the Israeli Army withdrawal.